Being able to measure employee productivity accurately is crucial to effective resource management and long-term strategic planning. Finding the most efficient way to track those critical metrics, however, can be a formidable challenge for even the most experienced trainers. In this post, we’ll reveal a frictionless method of how you can monitor team member productivity and providing educational interventions on-demand across your entire organization. As Head of Training, you know that a strong employee productivity trend doesn’t just happen. It takes a carefully honed on-boarding process and a time-tested continuing education model, along with exacting QA standards—from employee time management to health and safety compliance—implemented consistently across the organization. That means your productivity review process must be agile, yet laser-focused on your end-goal: to promote employee compliance with company QA and risk management directives while encouraging productivity. 1. Diagnose employee vulnerabilities to productivity drain. One of the best ways to fix flagging productivity levels is to find the root cause and work from there. With extensive historical data and an enormous amount of time, it may be nearly impossible to diagnose what went wrong when productivity rates take a nosedive. One type of platform to look into is an enterprise-grade LMS system that is able to enable managers to monitor and enhance employee workflow practices seamlessly. With consistent educational testing and data gathering via a LMS, diagnosing trouble areas in employee risk management compliance, for example, becomes less taxing and hard. Employees with poor QA compliance skills, risk management knowledge gaps, or lackluster workflow performance practices can be identified through testing and performance monitoring through integrated performance monitoring. If you are thinking about utilizing a robust platform solution, you will be able to see the heart of any effectively integrated employee performance management structure. Employees who experience poor productivity levels may have numerous reasons for poor performances over time. One reason might be that a limited onboarding process has left some employees with an insufficient understanding of company project and time management standards. Another reason might be that employees are merely confused about the parameters of their task management requirements. If you choose to go with a dedicated software with enterprise-grade features, it will allow management to diagnose the root causes of reduced productivity and to create targeted educational interventions to help get valuable employees back on track. The first-hand data gained from consistent employee assessments and user-generated feedback provides a detailed roadmap to enhanced productivity. Employee productivity levels may vary for a variety of reasons, but regardless of the root cause, your company needs a treatment quickly. Once the source(s) of a poor productivity trend has been identified, you should launch an educational intervention. Whether the issue is inadequate attention to health and safety standards or potentially tortious behavior that has become an unfortunate element of company culture, an educational intervention should be created quickly and presented across the organization with ease. Also, if you were to consider an LMS and performance monitoring system, employee post-intervention knowledge, retention and performance trends can be monitored from the same platform. That means your educational responses to fluctuating productivity levels can be created on the fly, targeted with precision to the needs of your employees. As Head of Training, you can’t afford to spend extra time fixing a training solution. Here are six facts to keep in mind as you evaluate your options for possibly switching to a dedicated software. 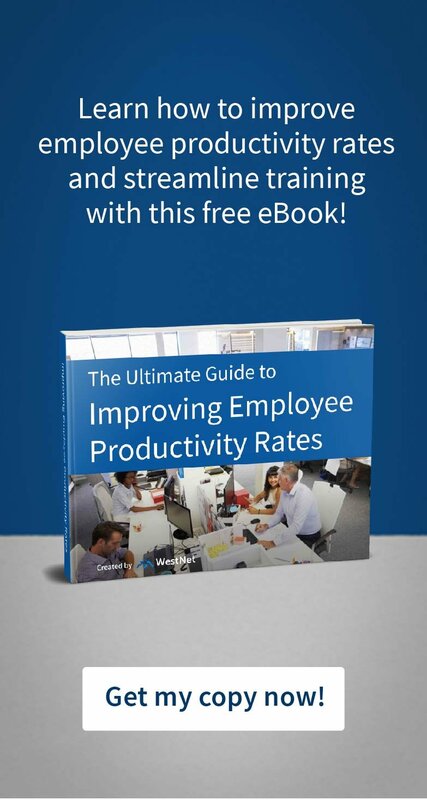 Access to a user-friendly, agile method to measure employee productivity is fundamental to the success of your company. Missing or inaccurate data can lead to corrupted employee evaluations. It is essential for employers to have access to an evidence-driven method to identify and address the reasons for poor employee performance. Employees with an excellent time, project, and task management skills should be identified and nurtured towards fulfilling their potential. Developing a continuing employee education program is key to encouraging and maintaining worker productivity. Some employees exhibiting low productivity rates may be future stars. An enterprise-grade learning management system allows employers to measure employee productivity while offering educational interventions for workers who show poor performance. An all-in-one learning management platform saves you time and helps you focus on stoking employee productivity levels. A healthy productivity trend starts with the on-boarding process. WestNet Learning provides Head of Training professionals with all of the resources that they need to create a customized robust employee performance management program that scales beautifully. For more than twenty years, WestNet Learning has partnered with growing companies and helped them develop employee training programs that scale according to their employees’ needs and their long-term growth objectives. If you would like to learn more about measuring your company’s productivity in a smart and efficient way, schedule a 1-on-1 walkthrough with on of our specialists today! When Should You Upgrade Your Staff Productivity Software? Recieve exclusive content and tips by email! Join over 3000 HR & Training Professionals and receive exclusive insights and tips! © 2019 WestNet Learning. All rights reserved. Website designed and developed by Responsify.